Posted by geoconger in Church of England Newspaper, Church of the Province of South East Asia. The Sultan of Selangor has returned Bibles and religious literature confiscated by the State Islamic Affairs Department on 2 Jan 2014 for using the world “Allah” in Malay and Iban language versions of Scripture to the Archbishop of South East Asia, the Most Rev. Bolly Lapok, Bishop of Kuching. On 14 Nov 2014, on behalf of the government the Sultan returned the Bibles to Archbishop Lapok, who is also chairman of the Christian Association of Sarawak, on the condition that they be distributed in Borneo, not in Malaya. A statement released by the Selangor Islamic Religious Council said the Sultan had ordered the Bibles be returned after state prosecutors declined to Bible Society officials arrested in the January raid on charges of proselytizing Muslims. Archbishop Lapok thanked the Sultan for his intervention in the dispute. “It would not have been proper to allow these Bibles to be stored indefinitely or destroyed. In this manner, the Bibles are being delivered to the ACS for distribution in Sarawak,” he said. The Federal Court of Malaysia has upheld a ban on the use of the word “Allah” by a Catholic newspaper, the Herald. The Christian Federation of Malaysia voiced disappointment at the ruling, but noted the decision “relates solely to the use of the word ‘Allah’ in the Herald newspaper. Therefore we ask the government and the judiciary to publicly remember that the decision of the Federal Court is limited to the specific circumstances of the case and for Malaysian Christians to continue to have the right to use the word ‘Allah’ in the Bible, in religious functions and gatherings.” In 2009 the Ministry of the Interior banned the Catholic newspaper from using “Allah” stating the word could only be used in connection to Islam. The Archbishop of Kuala Lumpur filed a lawsuit challenging the ruling, and prevailed at trial. However the Court of Appeal reversed the decision in October 2013, and by a vote of 4 to 3 the Federal Court last week upheld the Appeal Court decision.”We continue to support that the decision of the Court of Appeal, upheld by the Federal Court, is seriously flawed in many respects. According to Justice, many erroneous and inaccurate observations had to be corrected. Now there will be serious negative consequences for the religious freedom of Christians in Malaysia,” the statement said. The president of the Bible Society of Malaysia and the organization’s office manager were arrested by police on 2 January 2014, during a raid on their offices in Selangor. Officials of the State Islamic Affairs Department confiscated Bibles and religious literature for using the world “Allah” in Malay and Iban language versions of Scripture. The Archbishop of South East Asia, the Most Rev. Bolly Lapok, Bishop of Kuching denounced the raid as unlawful. “If an action assumes such arrogance that violates the Federal Constitution and pays total disregard to the Prime Minister’s directive is not treason, I do not know what is,” he said. A recent court ruling in Malaysia banned a Catholic newspaper from using the word “Allah”, but the government had given permission for the Al-Kitab, the Bahasa Malaysia/Indonesia translation of the Old and New Testament to use the world “Allah” for the name of God. Over 2000 worshipers from across East Asia celebrated the installation last week of the new primate of South East Asia, Archbishop Bolly Lapok. On 12 February 2012 Archbishop Lapok was installed as metropolitan archbishop of the Anglican church in Malaysia, Singapore, Vietnam, Cambodia, Nepal, Laos, Indonesia and Brunei at St John’s Cathedral in Kuching. The new archbishop was elected at a special meeting of the provincial synod convened in Kota Kinabalu on 22 September 2011 in succession to Archbishop John Chew of Singapore. The new archbishop will be the first non-Chinese primate for the province. Archbishop Lapok is an Iban (or Sea Dayak) born in Sri Aman, Sarawak. He trained for the ministry at the House of Epiphany in Kuching and received a Masters degree from the University of Birmingham. Ordained deacon on March 2, 1975—a special dispensation had been granted by Archbishop Donald Coggan as Lapok was then below the minimum canonical age for ordination—he was ordained to the priesthood on Dec 7, 1975 and served in Borneo. In 1991 he was appointed archdeacon and was elected Assistant Bishop of Kuching on Sept 5, 1999 and was enthroned as the Diocesan Bishop on April 15, 2007. He is currently Chairman of the Association of Churches in Sarawak. 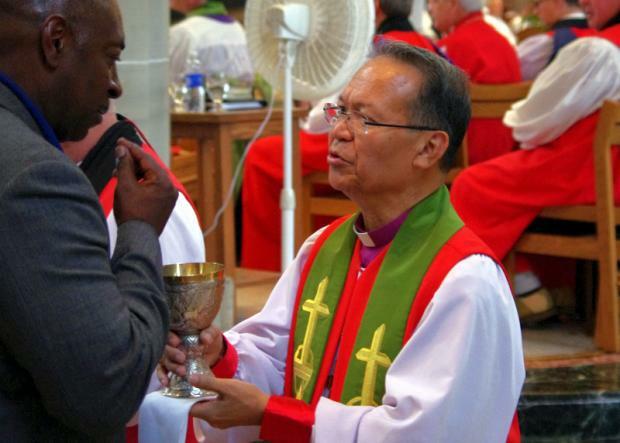 The Province of South East Asia reports the Bishop of Sarawak, the Rt. Rev. Bolly Lapok, has been elected primate and archbishop for the church in Malaysia, Singapore, Vietnam, Cambodia, Nepal, Laos, Indonesia and Brunei. A special meeting of the provincial synod convened in Kota Kinabalu elected Bishop Lapok as the province’s fourth archbishop in succession to Archbishop John Chew of Singapore on Sept 22. The new archbishop will be the first non-Chinese primate for the province. According to a press statement released by the province, Archbishop-elect Lapok is an Iban (or Sea Dayak as they were known in the colonial era) born in Sri Aman, Sarawak. He trained for the ministry at the House of Epiphany in Kuching and received a Masters degree from the University of Birmingham. Archbishop-elect Lapok’s installation is scheduled for Feb 12, 2012 at St. Thomas’ Cathedral, Kuching. A strong supporter of the Gafcon and Global South movement, the new archbishop is expected to take a stronger line than his predecessor in dealing with the issues currently dividing the Anglican Communion.